Applied Materials, Inc. and The Center for Science Teaching and Learning have announced the San Francisco Bay Area Grand-Prize winning team and finalist teams. 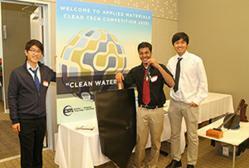 Monta Vista HS students earned 1st Place at the 2013 Bay Area Applied Materials Clean Tech Competition for their innovation called Struo, which mimics the unique water coalescing system of the Namib Desert Beetle. This second-annual collaborative competition is a signature program presented by Applied Materials in partnership with CSTL that challenges students to design innovative clean tech solutions to make the world a better place. The competition is held in three global centers of innovation: California’s San Francisco Bay Area, Singapore, and Xi’an, China. This year’s theme was “Clean Water for All,” and the Bay Area program involved 31 students from seven high schools, designing solutions to improve access to clean water and contribute to a sustainable future. The 10 Bay Area finalist teams competed for more than $10,000 in cash prizes sponsored by Applied Materials, with projects ranging from self-sustaining green houses and water filtration systems to thermoelectric water condensation and reverse osmosis applications. Winners were announced at Applied Materials’ headquarters in Santa Clara on Saturday, April 27, after student teams presented their designs to a blue-ribbon panel of judges from both industry and academia. The competition is designed to encourage students between 13 and 18 years old to solve a critical global challenge through inquiry-based learning while utilizing clean technology. In addition to developing the future workforce and instilling the importance and impact of science and technological innovation on our world, the program engages Applied Materials employees who serve as mentors to the students and oversee their design projects. The competition is just one way Applied Materials works to increase student access to science education opportunities to help them prepare for success in school and life. For more on Applied Materials’ role as a global corporate citizen, visit http://www.appliedmaterials.com/about/cr.